Now my hands are better, we decided to have a go at using my swift to ball up my yarn for my Simply Crochet Pick’n’Mix CAL. (Yes, I still havent started it…). I am planning to give it a go next week, when I have a 3 week break from work! I am hopeful that I can catch up. Anyways, I just wanted to tell you how much I love the swift! It was so quick and easy to use and it made balling up the yarn so much easier. When I tried to ball up the first ball, before I got the swift, it took me forever, and it resulted in anger and frustration as the last 20g ended up getting tangled! But this swift made it so easy and fast! My only criticism is the fact that it does creak a little sometimes. My advice is to condition the wood a little before using it – just rub a very small amount of vegetable oil up the shaft and the creaking pretty much goes away! I would definately reccoment the scheepjes swift – as well as being a well known good quality brand, it was actually the best price – unless you are happy to pay peanuts for something that is going to inevitably be rubbish. I bought this swift from Wool Warehouse for just 28.99. Bargain! Whilst I am on the subject of winding yarn, I came up with an ingenious (so say I) way of keeping track of my yarns for my CAL! All I have done is bought some cheap hair clips and then using a sharpie I have written the letter corresponding to the pattern. I dont know. Maybe this is a dumb idea. Maybe its something you have all been doing all along and I am just late to the party! But I am pleased with this idea! It helps me to keep a track of what yarn is what and also keep a track of the ends! 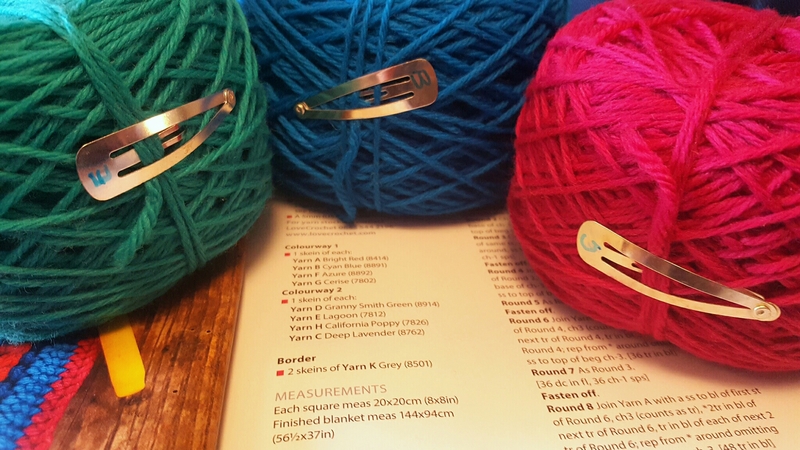 Do you have your own way of keeping track of yarns and colours? I would love to know! So, I finally managed to migrate my stamps to their new home. My mum and dad gave me this for christmas. I really love the colours and think it is really pretty. However, I opened it up expecting it to have at least a couple of sleeves in it, but sadly it did not. This is my first criticism. It meant that I had to wait a week for some inserts to arrive. 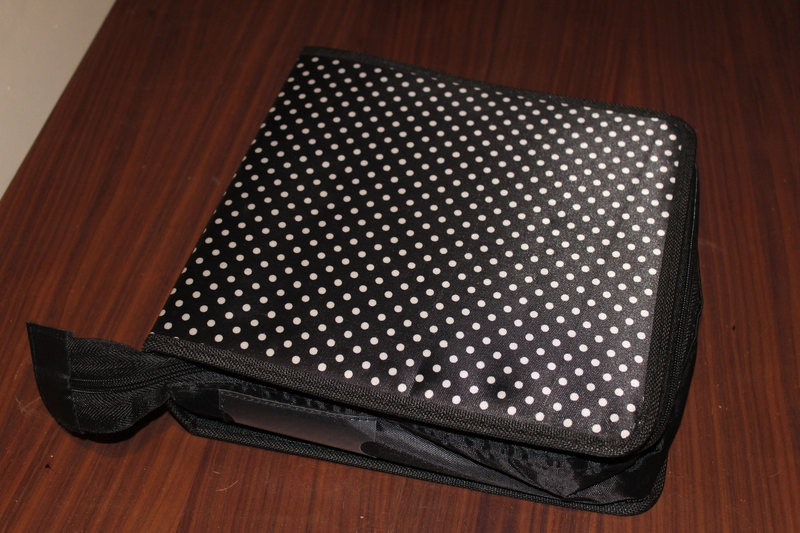 I have bought things like this before, for example my die folder? and they have had a set of sleeves to get you started. I dont think it makes it clear on the packet either that it is just the folder, with no sleeves included. My other criticism is the overlapping of the half sized pockets. 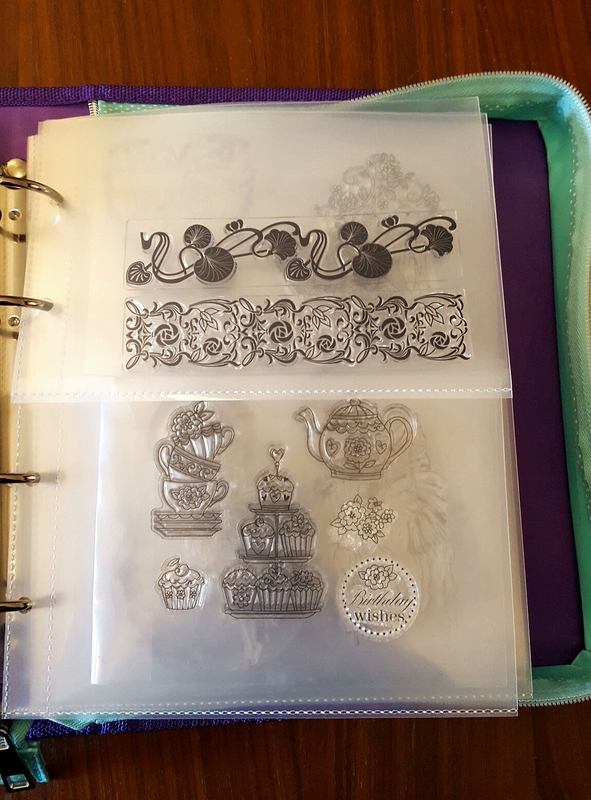 This picture would suggest that the half sized sleeves are the perfect fit and therefore the perfect way to store your smaller stamp sets. This, however, is not the case. As you can see, there is a clear overlap. I have tried to jimmy it in everywhich way I can but there is absolutely no way these sleeves could fit in as pictured in the sales image. This means that there is quite a bulge in the middle of the book – which wastes crucial storage space. 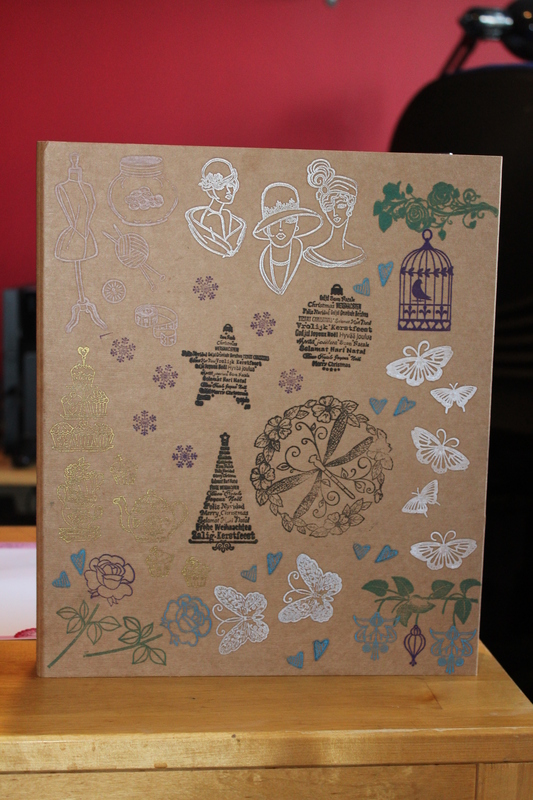 As a result, my stamp collection has already completely filled the folder to the point of difficulty zipping it all up. Over all, I am not terribly impressed. It looks lovely, is quite sturdy and is a great idea, but the design doesnt seem to have been terribly well thought about, which has led to a somewhat dissapointing product. for a long time, I have had loads of stamps but have had no idea what to do with it. And so they have just sat in a plastic storage box with loads of other craft gear. As a result, I haven’t really used them, because I haven’t really been able to see what I have. So last weekend, I decided to do something about it. 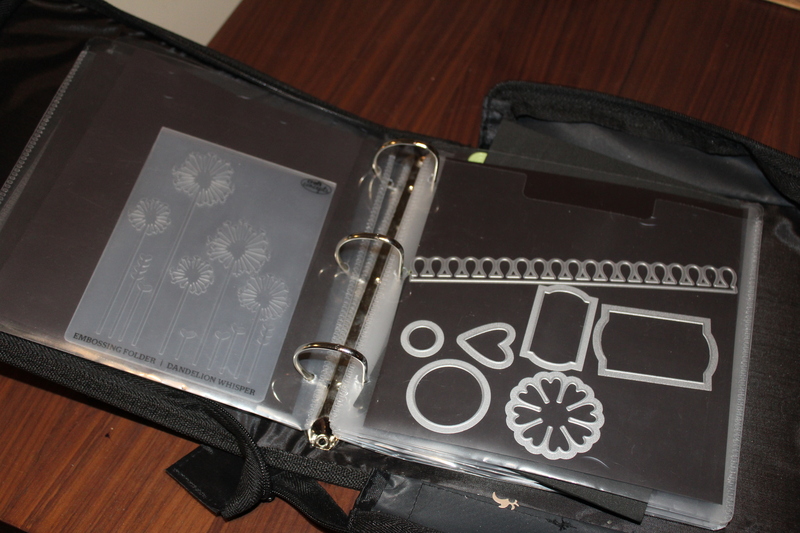 I bought a blank Kraft ring-binder from paper chase, some plastic wallets, and some a4 sheets of acetate. 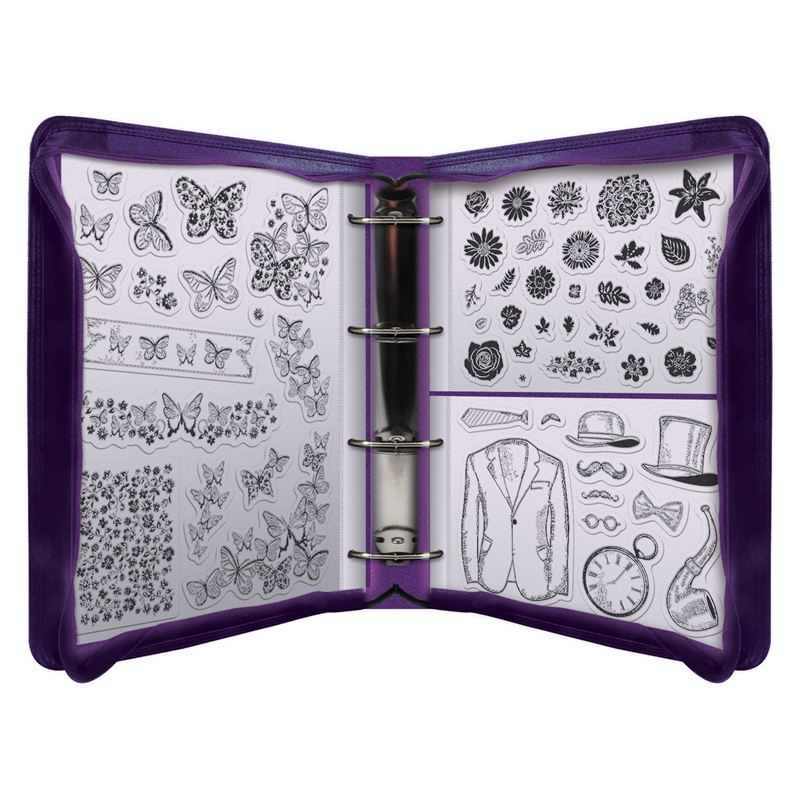 To decorate my folder, I just grabbed a load of colorful stamps and stamped all over the front. When you get the stamps, they will always come sandwiched between 2 sheets of plastic. one on the back (usually with the designs printed on it) and one on the front. 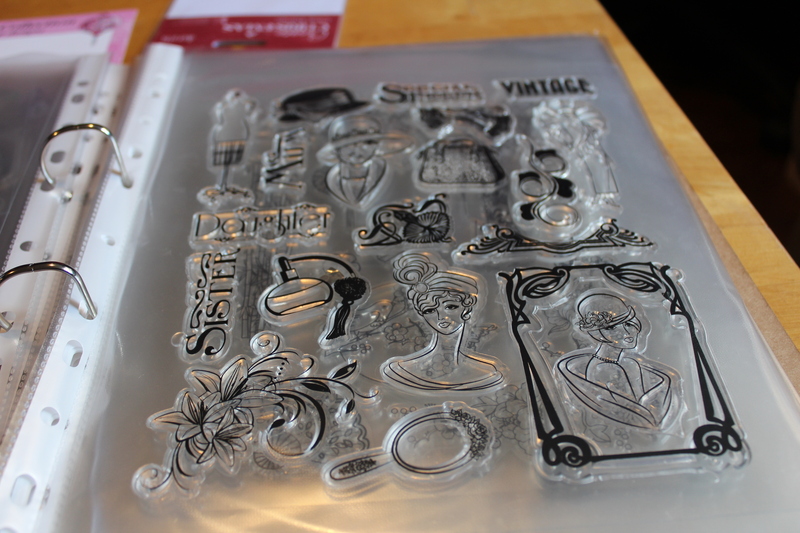 All I need to do is take the blank piece of plastic from the front off, then cling it to the acetate. Voila! Now I can see all of the stamps I own easily. Organisation is great – if you have everything you have shoved in a draw or box, it can be hard to know what you have and use it to the full. This brings me to a product I bought to organise my Dies. 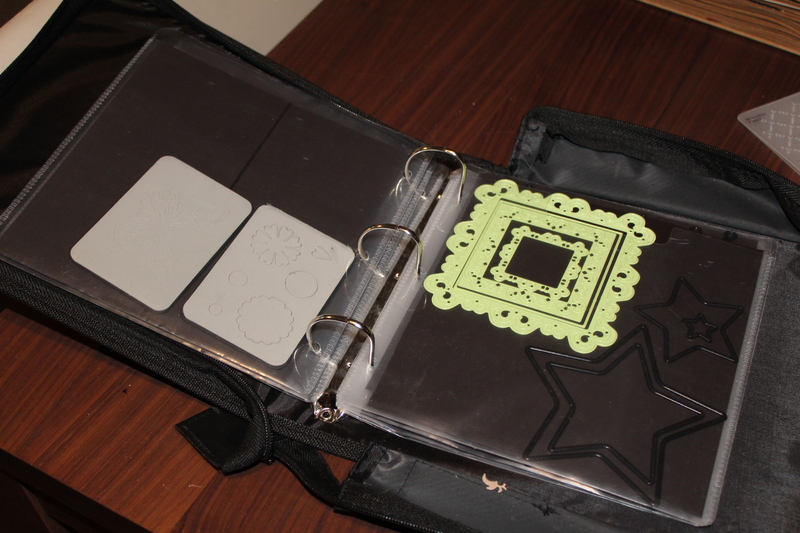 I bought the Papermania Die Storage Folder a couple of months ago, and it is one of the best purchases I have ever made. 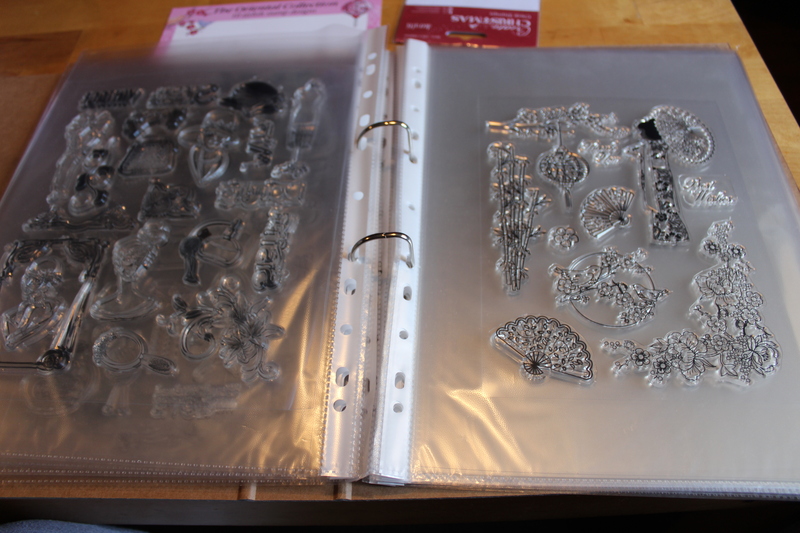 It really helps me keep my dies organised, and makes them much more transportable. And it has more than 1 application. 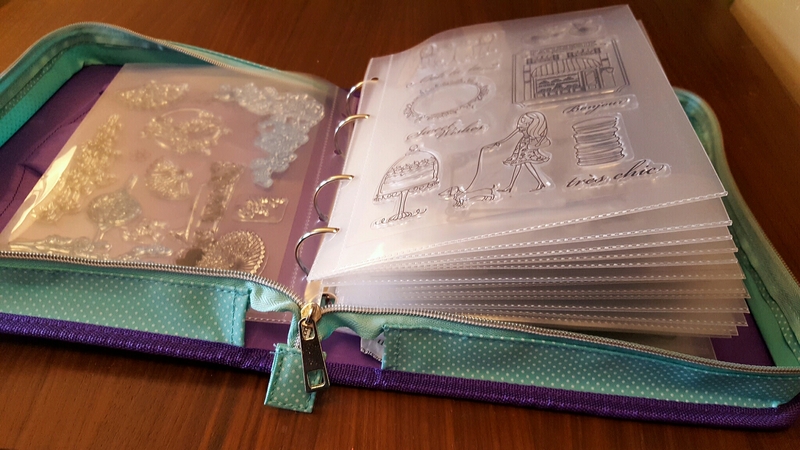 You can use the back of the pouches (the mag sheets are not double sided) to store thin cartridge dies and also your embossing folders! Genius. And don’t even think about throwing away the mag sheets that may come packaged with your dies. Just slot them into the backs of the pouches – this will save you from having to buy quite so many extra magnetic sheets and pouches. 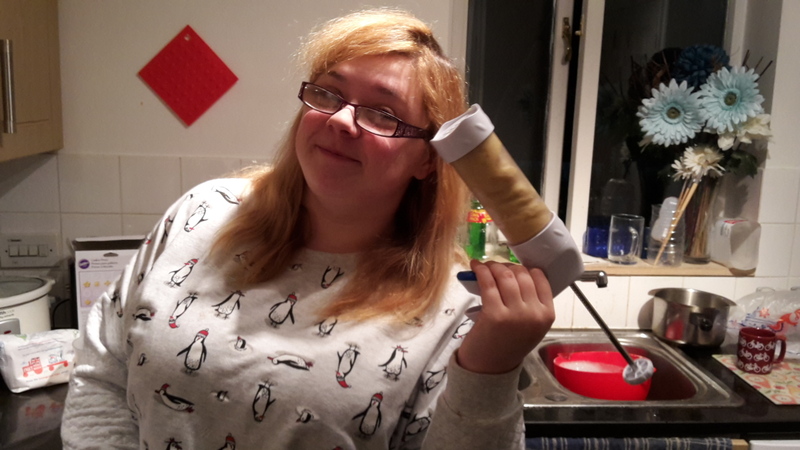 So for Christmas, my other half’s mum bought me the Wilton’s Cookie Gun. 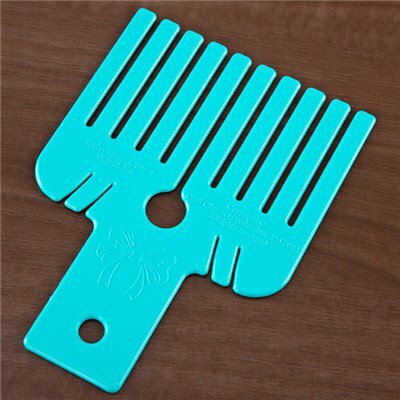 I have used it now a few times, and can say without a doubt, I love it! This device is absolutely fab! As long as you use the right consistency of cookie dough. The first time I did it it worked perfectly fine. I used the recipe on the side of the box but halved the quantity cause i didn’t want 8 dozen cookies! and they turned out perfectly, as you can see above. The second time I used it however, it didn’t go as well. The first trays worth just completely lost shape and expanded, so I added more flour. the second trays worth expanded but at least somewhat kept their shape. so I added more flour. It wasn’t until the third tray that they came out OK. I mean, don’t get me wrong, they still tasted great. they just weren’t as perfect as they could have been. I don’t know why though. the only difference was the addition of vanilla and almond essence, which i didn’t use the first time round. 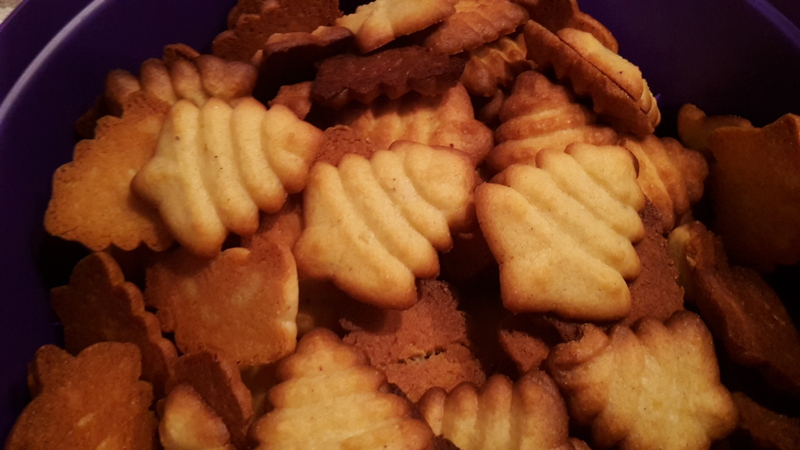 Anyways – if your consistency is right you biscuits will come out beautifully. The one tip I have is to use parchment. NOT GREASE-PROOF! if you use grease-proof paper, you will find that the dough doesn’t stick, so the dough wont stick to the tray and will instead just stay attached to the gun! I would highly recommend getting this if you are a cookie lover! 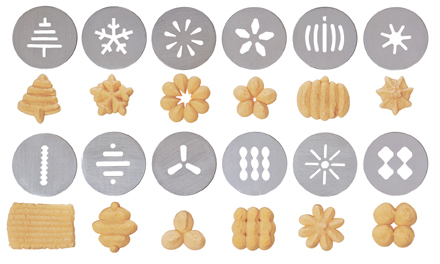 After you master the technique you can almost guarantee perfectly shaped cookies every time! So, I found this pen though a magazine. 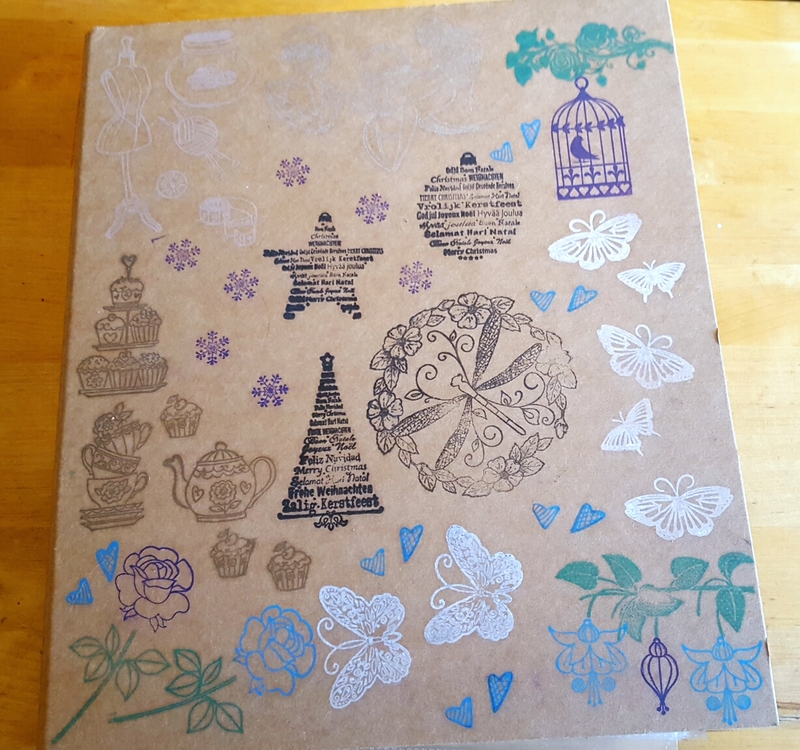 I was having a play with my die cutter, as I had a new set of sentiment dies, and was having trouble adhering them to my cards as i didn’t have any fine enough glue applicators, so ended up with ugly splurges around my sentiments. I mentioned this issue to my Auntie, who also happens to be into making cards, and we said we would have to look into it. and soon after, she spotted a letter asking for advice on just this issue in her monthly card making magazine. so I checked it out. It seemed the best way to purchase these was through Ebay, so on I popped, and I managed to get them for around £2.50 per pen (Quick tip – if looking for something on Ebay, see if the seller also has an auction lot of the same item. Many of them do both auctions and buy it now listings, so find out what you would pay buy it now, and then enter that as your max bid on the auction. this way, you will never pay more than necessary, but, like I did with these pens, you may find that you can get them for a cheaper price). I got 3 in the end, two of which I kept for myself, and one of which I gave to my auntie. I must say this pen is fab. it is literally a Biro but with glue instead of ink! This means you get fantastic control and detail, making it perfect for fiddly little bits, like sentiments and other more delicate dies. and because you use such a small amount each time, it lasts a while, making it excellent value for money. My only gripe is that it is very quick drying! I mean super quick! Which is great in some instances, but can be a bit problematic if you have a lot of area to cover! 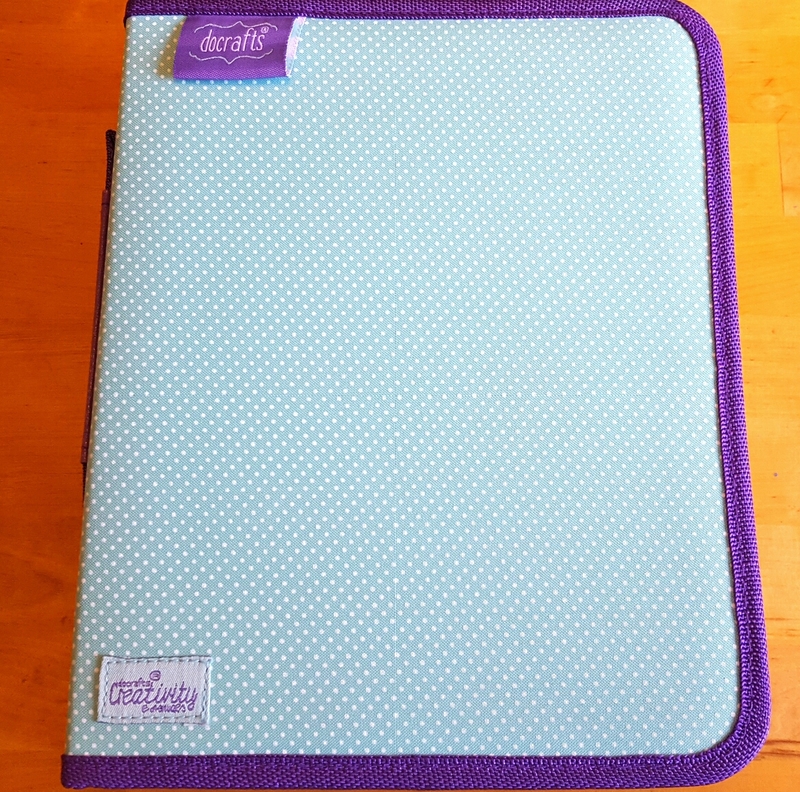 Over all, I would say this is definitely an essential addition to your crafters stash, but you may have to master a technique to get the best out of it. You need to work very quickly! Just popping by quickly on this fab boxing day (I say fab, I have had to work all day but hey, money is money isn’t it?) to share with you some of my fave fb pages and some of their most fab makes! 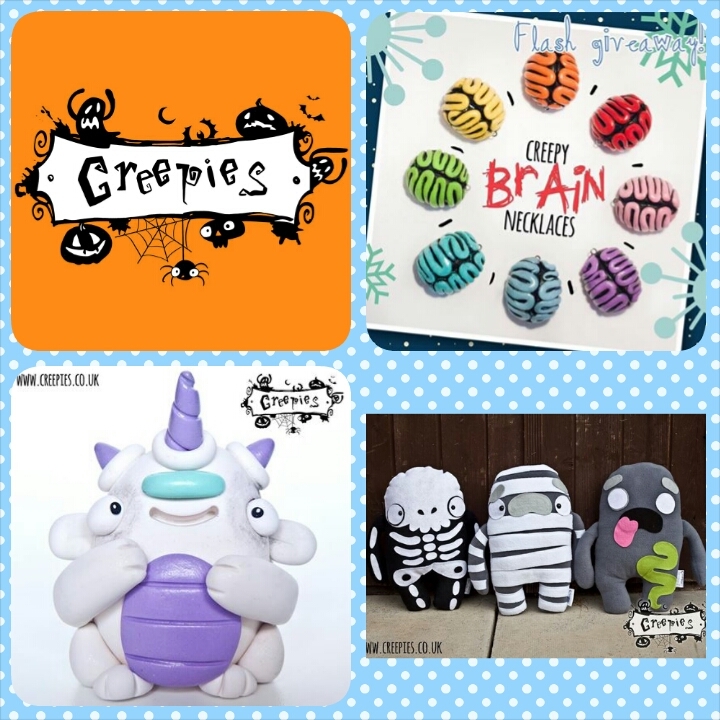 From felt to fimo, doodles to Theres plenty of variety, so maybe you will find something you will love too! Fake a Cake Ltd. Images belong to them and not to me. Page number one for me has to be Fake A Cake Ltd. They are just fab! 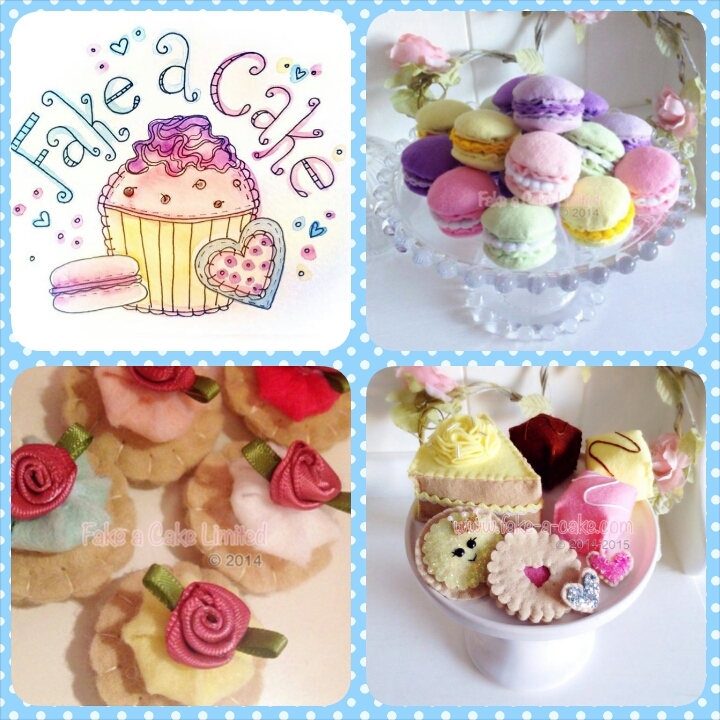 They make fab little felt cakes and biscuits of all shapes and sizes, and they have to be one of the most successful Facebook businesses I have seen. Everything is so lovely and so professionally made, that you cant help but fall in love! One day, I will be able to justify buying as couple for myself! Creepies. Images belong to them and not to me. Page number two is Creepies. They are AMAZING! If you browse through their pages you can see plenty of tributes to popular culture icons and film characters! They have a lot of cool fimo stuff, but also plushes, jewelry even little badges and mirrors. The artwork is beautiful and the quality of the make is superb. I bought my mum a brain necklace from them (As can be seen in the top right) and she loves it. It is so fab. Definitely would recommend them! V’s Pottery Shed. Images belong to them and not to me. 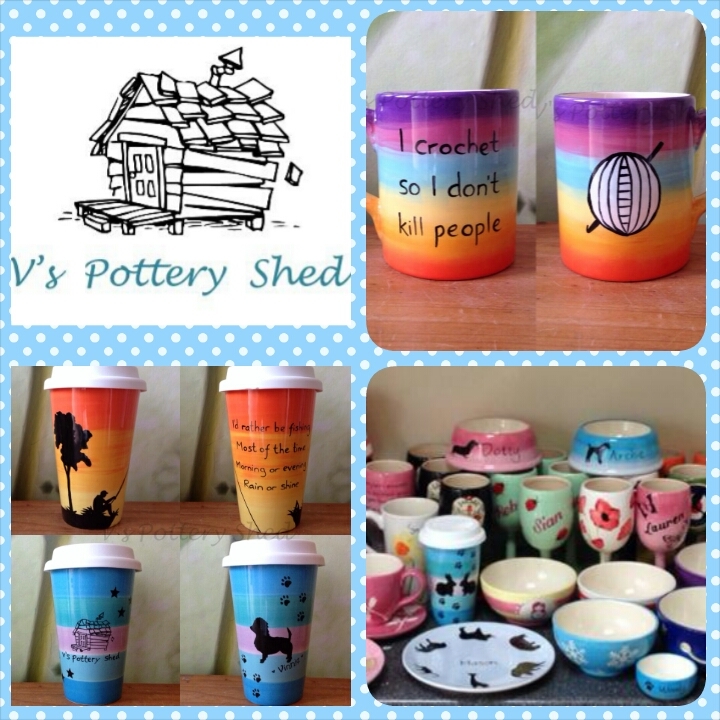 Number three in my list is V’s Pottery Shed. I first saw this page pop up in my news feed with a beautiful rainbow mug bearing the statement: ‘Bugger Off, I’m Crocheting!’. I fell in love. I haven’t been able to buy one for myself as of yet (Anyone wishing to buy me a present, take note) but I did buy two items from this page as Christmas presents. The aforementioned mug for my lovely auntie Joanne, who loves it! and a travel mug (The orange one, bottom left) with a fisherman and a fishing poem on it, for my granddad. the quality of the painting and glazing is superb, and I will definitely be purchasing from them again in the future! I might buy myself a yarn bowl. Anne’s Doodles. Images belong to them and not to me. Finally, it is Anns Doodles. I love this ladies artwork, it actually inspired me to buy a set of promarkers and get back into doodling. 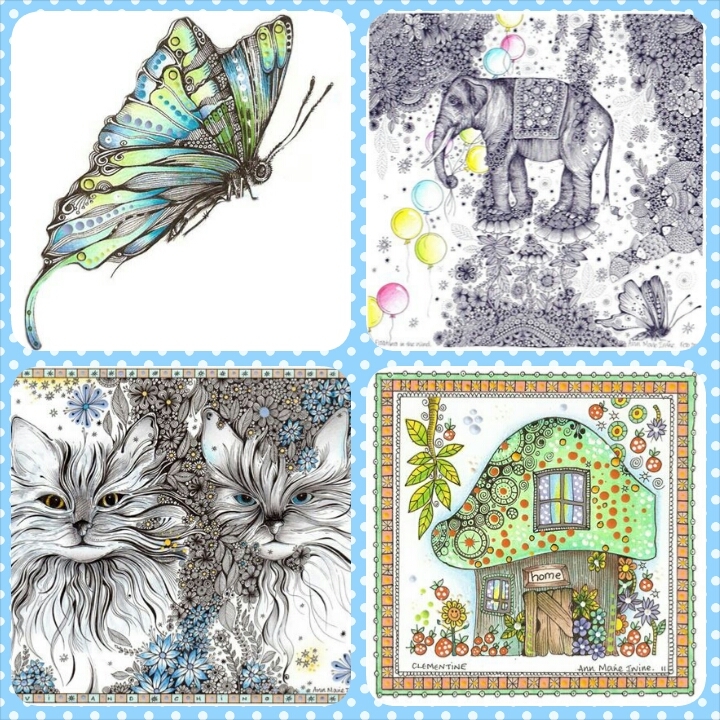 In October, I made a purchase from this page, I bought both the elephant (top right) and cat (bottom left) prints as cards, one was given as a birthday card for my partners cat mad mum, and the elephant was framed in a lovely blue wooden frame and gifted to my elephant loving Nan for Christmas. I love watching Create and Craft on the television, and I saw this bow maker on several occasions being used in projects! I must admit, I wanted one, but I couldn’t justify the price tag. Then my birthday rolled round, and I was given some money, and I thought ‘What the hell, lets buy it!’ so I did! And I totally don’t regret it! I really struggle to do nice neat bows by hand, but this tool makes it so easy! every single time they come out perfectly! you can see the consistency in my previous post, where I made many little ribbons to put on my Christmas tree, and each was just as perfect as the next! Whats more, when you buy the bow maker you also get a DVD with some fantastic tutorials on, which I am currently working on. I would totally recommend finding yourself some cheap, disposable ribbon, just so you can have a bit of a practice before you go at it with your nice ribbon. My only snagging point with it (and its very small) is that sometimes the knots are a little loose. I found that the bows my partner made with them were a little loose so the loops of the bow slipped about. I think this is just because he wasn’t pulling them tight enough. He was worried about breaking the teeth of the tool. But don’t worry, if you watch the videos you will see how durable it is – so go ahead, tighten that know until the teeth bend!